Paper to Pearls™ was the unexpected outcome of a trip that VFGC president Barbara Moller made to northern Uganda in the fall of 2005. Barbara went as one of a team of trainers on a U.S. State Department project to create a coalition of local municipal officials and civil society leaders that would lobby and advocate nationally and internationally on behalf of the region. dependence on international relief organizations. Joyce Laker, one of the participants in the training, invited Barbara to visit two displaced persons camps where she had started a small beading project. Utilizing a grant she had obtained from CARE International, Joyce had recently brought a trainer from Kampala, the Ugandan capital, to train women in the two camps in how to make necklaces from recycled paper. 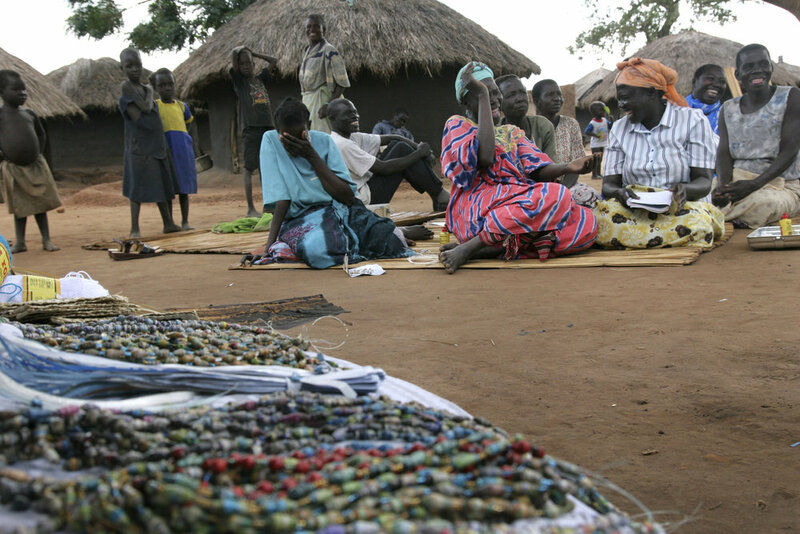 She thought that sales of necklaces on the streets of Gulu, the local town, would be a way to help the women. The money wouldn't be much, but it would be something. Barbara, however, saw it differently. What she saw was an opportunity to provide significant income for the women if she could create a market for their work. Two months later Paper to Pearls was born. Although starting with no experience in micro-enterprise or retail sales, Barbara saw the initiative as a natural extension of the mission of VFGC―to help give a "voice" to those who have traditionally been silent. In this case, by helping lift desperately marginalized women out of poverty, it would be giving them a voice in their future and the future of their families and communities. The unique jewelry is crafted from strips of colorful magazine paper that are rolled into beads, secured with glue and then varnished for sheen and durability. The beads are then assembled into necklaces, often with matching earrings. The jewelry is remarkable for its striking appearance....and no one imagines the beads are made of paper. The story of Paper to Pearls' inclusion as part of an international paper jewelry exhibit in Milan, Italy. in four camps and two cooperatives in the town of Gulu. comes to us when they know that Paper to Pearls is here," said one of our beaders. "Everyone is excited."